Precision ping-geared machines with smaller machine button for six-left headstocks. Covered machine that duplicates the style used on vintage and reproduction models. 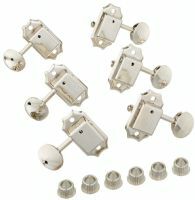 The P2622 Classical tuning machines feature polished nickel plating and nylon rollers with butterfly ivory colored buttons. Designed for nylon string classical guitars. This is a set of 6 with 3 per side. Nickel lyra-style plate, nylon tollers, contrasting black worm gear, pearloid oblong buttons. These covered Ping bass machines are smaller in size to fit many modern electric basses (3/8" posts).